Site suggestions or a problem with the site? also look here for announcements! Thank you both. Great help. Discuss all your RS3 tuning and modifications here. Seeing a RS3 is a rare sight, post your sightings here. Discuss cleaning and detailing - show off your RS3! Organisation of RS3 meets and events. Share your Audi dealer experience, good or bad! Show off your RS3 here. Talk about anything non-RS3 related...tutt! Discuss all other makes of car, including other Audi's. 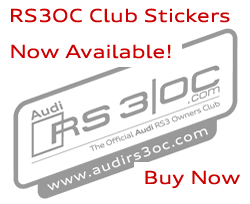 Please donate to support Official Audi RS3 Owners Club Forum. We appreciate all donations! 15% of donation goal reached. A bit of decat trouble, please help!